The SugarBee® apple was created on a sunny spring day by an industrious bee who carried pollen from a Honeycrisp blossom to an unknown tree. Mother Nature did her part and the SugarBee® apple was born. Grower Chuck Nystrom noticed the branch in his orchard as it produced a beautiful bi-colored apple that was crisp and Sweet as can Bee. 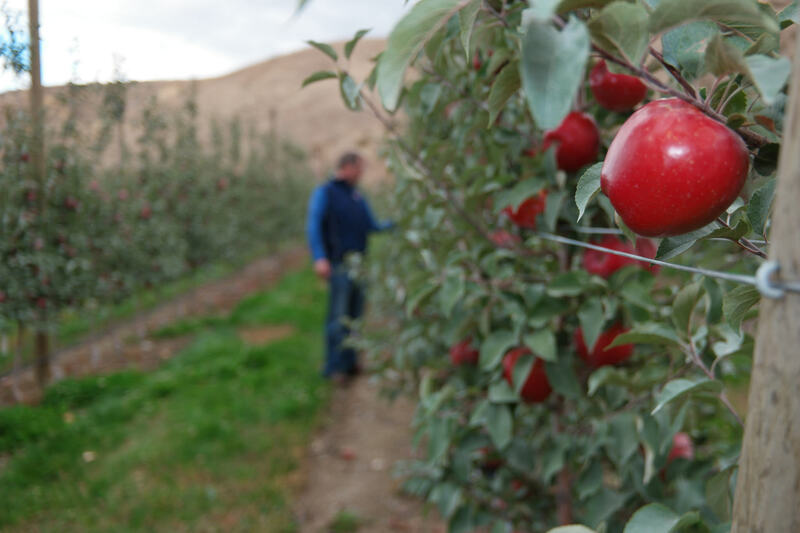 The growers at Chelan Fresh agreed with Mr. Nystom and made the decision to grow the SugarBee® apple. One of these growers is Harold Schell, who manages variety development to determine what new varieties will be friendly to grow, harvest, pack, and also have consumer appeal. 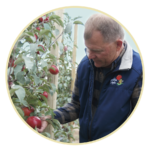 Harold has been lovingly nick-named the “Manny”of SugarBee® apples, as he applies over 40 years of experience to nurture new varieties such as the SugarBee®. 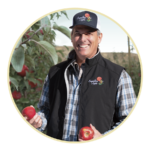 Jeff LaPorte and his family are proud growers of SugarBee® and honeycrisp apples on their acreage. 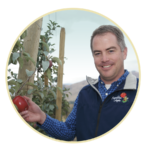 Jeff also works to advise many of our growers on best growing practices to produce high quality Chelan Fresh fruit. Mark Stennes is a 4th generation grower and his family has farming roots that date back to the early 1900’s. The Stennes family is committed to create opportunities for future family members to become part of the family operation by growing a variety of apples, cherries and pears using both conventional and organic practices. 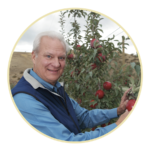 Tom Riggan was born into an agriculture family and followed his knowledge of apples, pears & cherries to working in sales and management. Tom rarely misses an opportunity to get out in the orchard and stay connected with the crops. He spends his remaining free time attending kids’ activities and long distance bike riding. 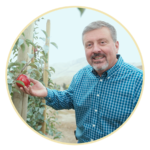 Jim Colbert brings 35 years of experience in Horticulture and pest management to his current position as Organic Program & Packaging manager at Chelan Fruit. His 3rd generation grower roots keep him passionate about spending time in his family orchard and when he can break away, he enjoys snow and waterskiing. Many of our SugarBee® growers are part of 3rd and 4th generation families who are passionate about growing high quality apples, pears and cherries. They are committed to best agriculture and business practices so that their families can continue to farm for future generations. These are the best apples I’ve ever ate. I gave them as Christmas gifts this year! I’m wishing now I had keep them because I can’t find them any more. Do you know where I can find anymore of these apples? I was buying them at Walmart but they don’t have any more, the’re even out of the Sugar Bee apple cider. What is the growing season so I can look for them. Thank you for your interest in our SugarBee® apple. We think it is an amazing Sweet as Can Bee apple too! The SugarBee® apple is a new variety so the crop size is limited and only available for a short time this crop season. Each year the crop size will grow and continue to be available at more retail stores. We have a FruitLocator.com and you may be able to find SugarBee® at other retail stores. What is your zip code? The SugarBee® is known to keep well so next time you find them, buy extra and keep them in your refrigerator produce drawer! And be sure to tell your local Produce Manager how much you like SugarBee®. They do listen and will be more likely to bring SugarBee® in again next year. I’m not usually a fruit eater because I’m very fussy about the texture of the fruit and I end up throwing the fruit out if the first bite is mushy. I can tell you the SugarBee Apple is a pleasant surprise and I love the sweet and firm texture of this apple. I hope my grocery store can keep them on the shelves I have a feeling these apples will be gone as soon as they hit the store once people taste them.